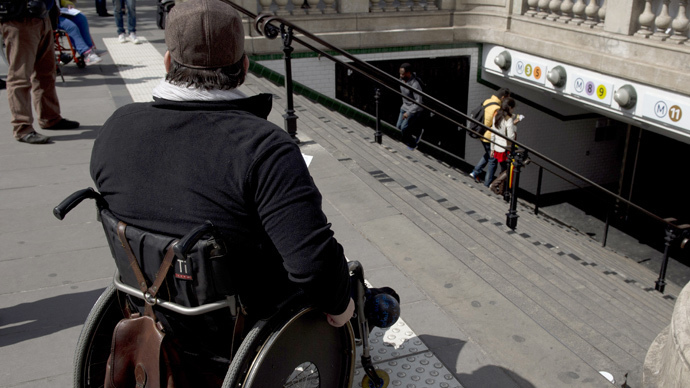 Swiss scientists have created a cyborg-style implant they hope will soon give paralyzed people a chance to walk again. So far, it has been successfully tested in labs, which means clinical trials with humans should start soon. 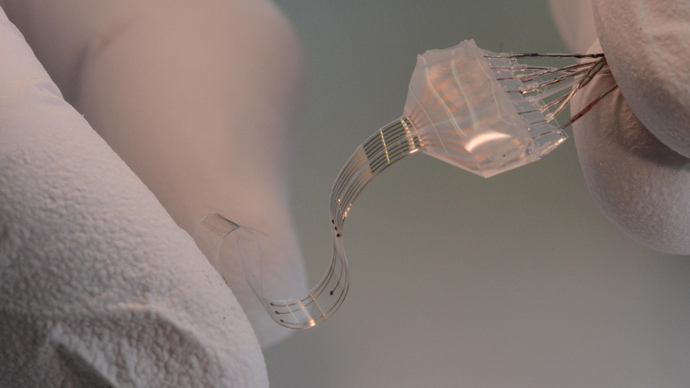 The soft, stretchable device, dubbed e-Dura, is the brainchild of scientists from the Swiss Federal Institute of Technology in Lausanne. It is designed to act as a “bridge” between two ends of severed spinal cord and deliver electrical impulses and drugs. It is named after dura matter, a thick membrane that surrounds the brain and spinal cord. Due to its softness and flexibility, this silicon and gold “ribbon” implant doesn’t cause inflammation and rejection when connected to spinal tissue. To make the gold even more elastic, the scientists laid it down in layers of just 35 nanometers (0.000035 millimeters) thick. "The spinal cord expands and relaxes," said Professor Stéphanie Lacour. "If you have a hard, non-deformable material, the friction and rubbing cause inflammation." The implant imitates the mechanical properties of living tissue, and can simultaneously deliver electric impulses and pharmacological substances with little risk of damage. In previous attempts, similar implants caused the immune system to reject the “foreign body,” and so they had to be removed. The Swiss scientists believe their e-Dura can last 10 years in humans before its needs replacing. “Our e-Dura implant can remain for a long period of time on the spinal cord or the cortex, precisely because it has the same mechanical properties as the dura mater itself,” said Lacour. The researchers, supervised by Professors Lacour and Grégoire Courtine, managed to get paralyzed rats to walk on their own again, with the help of electrical and chemical stimulation. Their research was published in Science Journal. “It’s the first neuronal surface implant designed from the start for long-term application. In order to build it, we had to combine expertise from a considerable number of areas,” says Courtine. Lacour and Courtine hope that soon they will be able to apply the method to humans. The potential of e-Dura is enormous, and it could also help patients suffering from epilepsy and Parkinson’s disease. “This opens up new therapeutic possibilities for patients suffering from neurological trauma or disorders, particularly individuals who have become paralyzed following spinal cord injury,” explains Lacour. The researchers say they are planning to start trials on humans and to develop their prototype for commercial use.